Includes three great products at one low price! 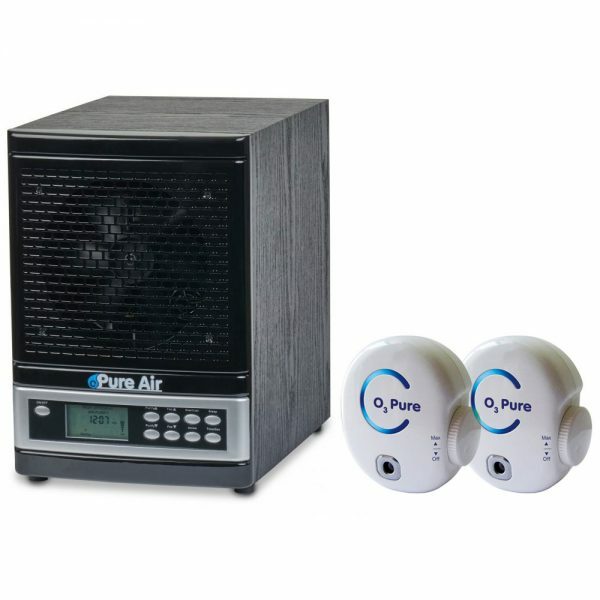 Package includes our newest O3 Pure Whole Home Air Purifier with remote and two versatile Breeze-50 Plug In Air Purifiers that can go anywhere – even tight spaces. Includes All Three Items at One Low Price! Whether you or your family members suffer from allergies to pollen, mold spores, pet dander, VOC (Volitile Organic Compounds), or cigarette smoke, the O3 Pure Whole Home Air Purifier has 7 levels of filtration which are designed to take aim at airborne allergens in your home or office, making your air cleaner and fresher. Try it. Your satisfaction is so important to us that we ask that if you don’t feel the improvement within 60 days we want you to return the product for a full refund. The plug in O3 Breeze 50 Fresh Air Room Deodorizer is one of the most powerful units on the market today. With its small size it packs quite a punch. We recommend initially trying yours at the lowest output setting and adjusting it accordingly to your needs. In most spaces, even a low setting can achieve some impressive results in just a few short hours. The O3 Breeze 50 is perfect wherever mold, mildew, bacteria and unpleasant odors are a problem. It boasts a hand oiled fan system and each O3 Breeze 50 is tested and assembled in the U.S.